The Master of Suspense, Alfred Hitchcock, began his movie career as an inter-titles designer for silent films in Britain and had just begun directing when sound films were introduced in the late 1920s. Though his early British films were successful, it was the films Hitchcock made after coming to Hollywood in 1939 that made him one of the most recognizable and commercially successful film directors of all time. Oddly enough, though he was nominated for five Best Director Oscars, Hitchcock never won the prize. However, he did received the Irving G. Thalberg Memorial Award from the Academy of Motion Picture Arts and Sciences in 1968. In his eleventh film, BLACKMAIL (1929), the first talking picture made in Britain, Hitchcock began making now-famous cameo appearances in each of his films. In BLACKMAIL, he can be seen on the subway being harassed by a little boy. 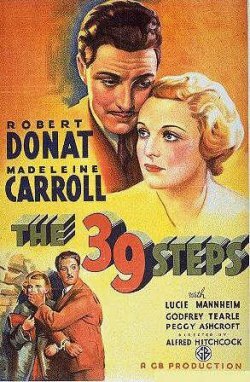 In THE 39 STEPS (1935), one of Hitchcock's most successful films from his early British career, featuring Robert Donat and Madeline Carroll, Hitchcock made his cameo appearance as a litter bug outside a London music hall. "A Train through Scotland" with Robert Donat and Madeleine Carroll (a .AVI file). Pursuing greater opportunities than those available in Britain, Hitchcock moved to Hollywood in 1939. His first film made under contract to producer David O. Selznick was an adaptation of Daphne Du Maurier's REBECCA (1940), starring Laurence Olivier, Joan Fontaine and a host of talented British character actors including Judith Anderson, George Sanders, Gladys Cooper, Florence Bates, Nigel Bruce and C. Aubrey Smith. 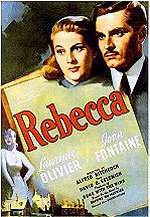 In addition to popularity with critics and audiences, REBECCA also won the Academy Award as Best Picture of 1940 -- Hitchcock's only film to take the top prize. 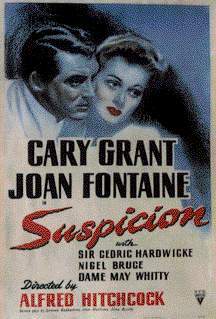 In 1941, Hitchcock acted as producer and director on SUSPICION, another popular suspense thriller set in his native England (though again filmed in Hollywood) and starring Joan Fontaine as a wife who fears her husband, Cary Grant, only married her for her money and is now trying to kill her. Although SUSPICION marked Hitchcock's last film with Fontaine, it proved to be the first of four successful teamings with Cary Grant whose cool and charming demeanor made him one of Hitchcock's favorite leading men. "Suspicion" (clip) by Franz Waxman (a .MP3 file).